Last weekend we were invited to visit North Wales as part of the Visit Wales Year of Adventure campaign. With the aim of inspiring you to “Find Your Epic“, the campaign is all about stepping outside, discovering the fantastic landscape and experiences that Wales has to offer, and doing something amazing. Now obviously you may have noticed we love our days out in the great outdoors, and we’ve pottered around parts of North Wales before, and we’ve loved it so we were keen to go again. Although we’ve been to Snowdonia before, what I really wanted to do, as I explained in this post about our visit to the National Slate Museum, was go up Snowdon on the train. Alas, the train is seasonal and we were just a bit too early in the year. 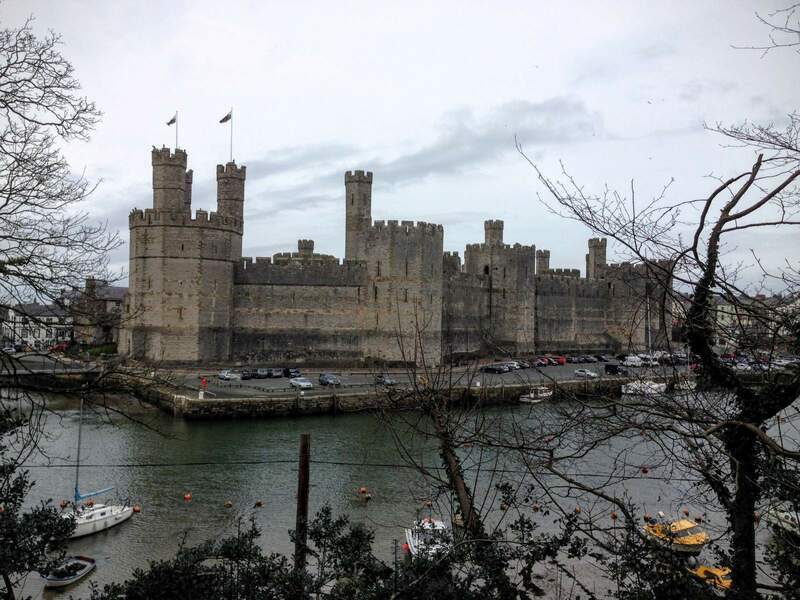 So we decided to base ourselves in Caernarvon in Snowdonia in North Wales; with beautiful beaches, phenomenal castles, and stunning landscape all on offer, it is the perfect option for a family break. We travelled down on Thursday, and arrived, in the dark, to our guest house which is in a part of the town actually within the medieval stone walls, so it was quite exciting to think about spending the night in a castle! 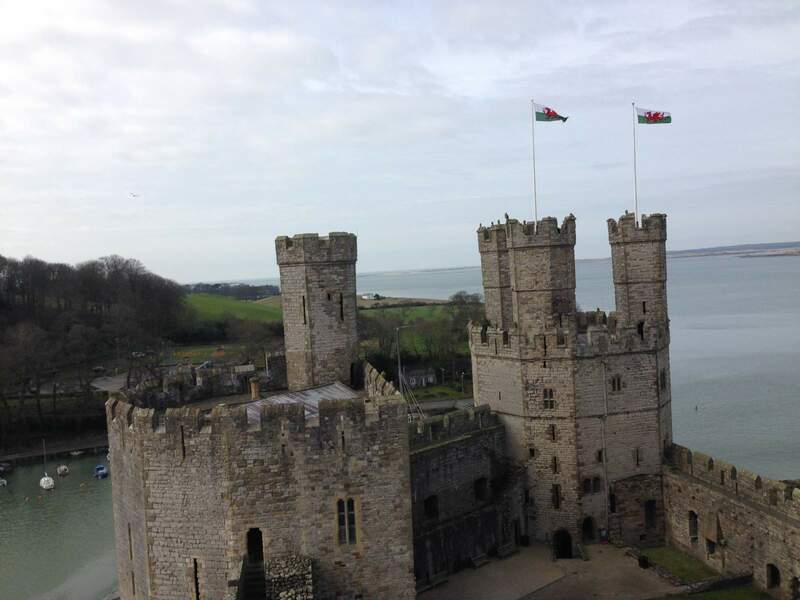 In the morning, we set out to explore castell Caernarfon! Approaching the castle from our car park (4 hours – £4) it seemed really enormous. 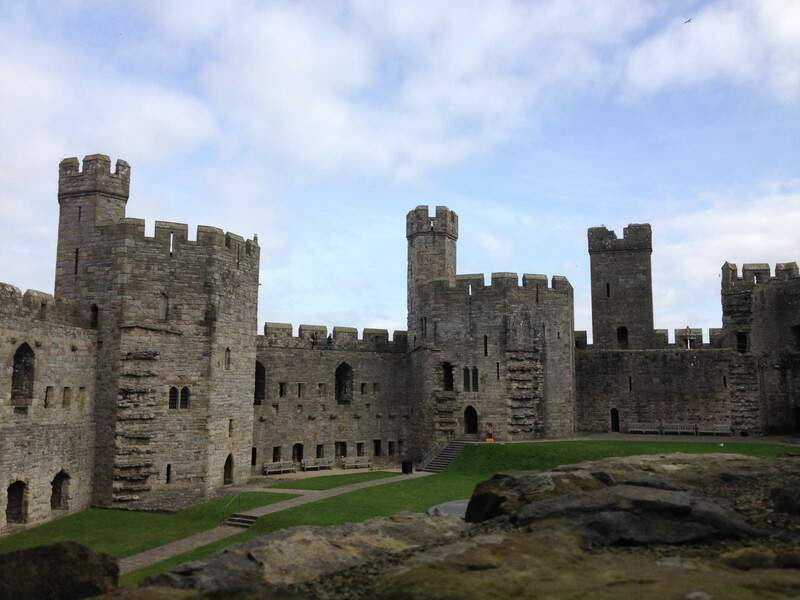 Built in the 1280s intending to show the Welsh who was boss (the English, of course) this is an impressive building. It is full of turrets and towers, which you can climb up, so Noah had to go in the sling for his safety and our speed. He didn’t mind – apparently a castle is a great place for a two hour snooze, and he only woke up at picnic time. Entry costs £7.95 for adults and under 5s go free. 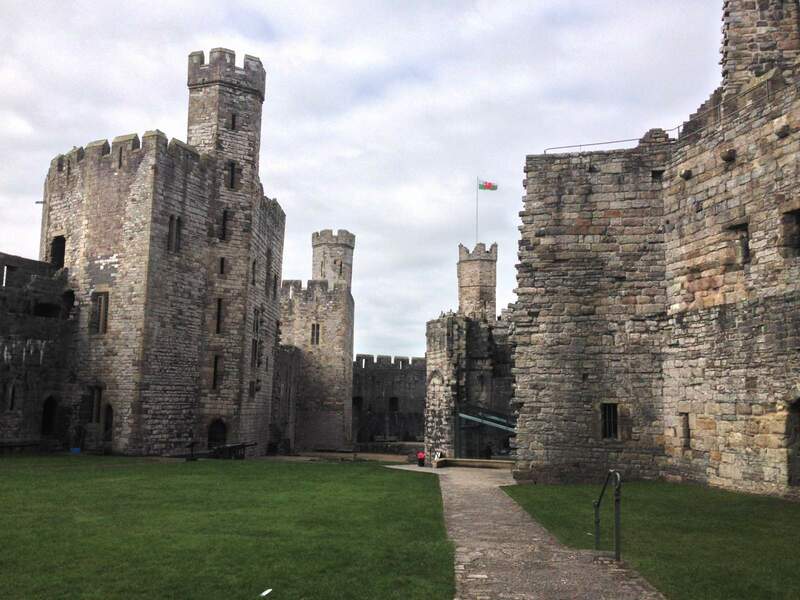 I bought a guidebook (£3) with the intention of wowing you with facts, but Visit Wales have done it for me – check out this link to find out more information about the history of the castle. There is a small leaflet given to you on entry which has a map of the castle inside, as well as a treasure hunt for children. You can go around various points of the building to seek out discs on the walls. The discs have pictures of creatures on them, and when you find it you write down the letter indicated on the disc so that when you’ve completed the trail you’ll have the right order for a dot to dot puzzle. We completed it and were awarded a sheet of stickers and huge congratulations. We felt like we definitely had achieved something – particularly as I was told that many people give up part way through. 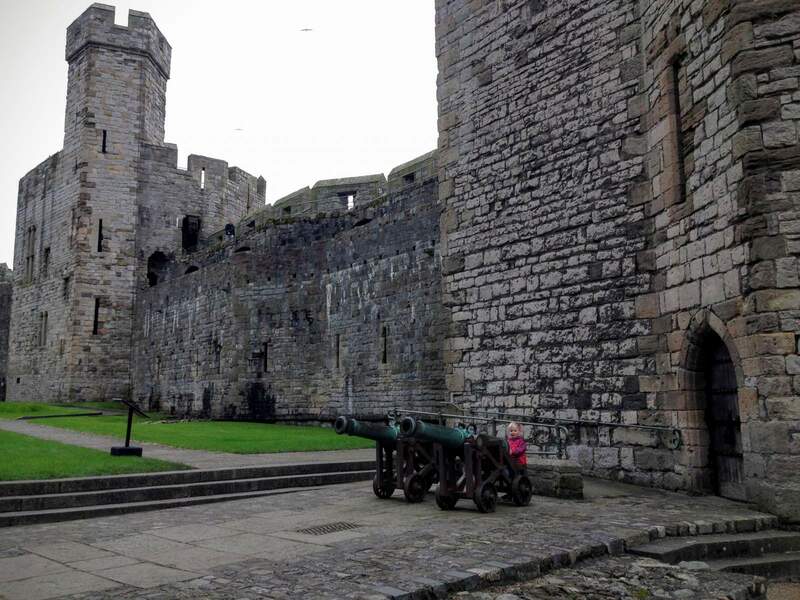 There are a couple of things in the castle James did not enjoy: a multimedia presentation that was so loud he was terrified, and the hand wash machines in the toilets. Otherwise, this is a brilliant place for a good explore with the family. Climbing the little stairs got a little bit hairy at times – they’re spiral staircases and extremely narrow at some points, and of course preschoolers have this amazing confidence one minute – jumping on the tiny steps put my heart in my mouth – and complete timidity the next minute – refusing to go any further up the stairs when we were steps from the top meant we had to hold hands all the way down a twisty twiney turret was fear inducing for me!! There’s a museum inside with displays about soldiers through the ages in the castle. We didn’t go too far in as we could hear shouting from down the corridor and after the screaming fear of the last loud presentation and not knowing exactly what it was I could hear – I thought it best to leave that for another visit. We did spend quite a bit of time looking at medals in the impressive display and then colouring in little printed medals provided in a basket full of colouring pencils. There’s a dress up area too, but James was happy just colouring. We were happy to discover benches at the edges of the courtyard, and settled down for our picnic. There is a supermarket very nearby and we had visited to buy lunch before entering the castle; no cafe or other facilities for buying food are inside the building, but you are able to leave and re-enter all day. Toilets are available at one end of the courtyard only. After lunch we finished off our treasure trail and explored some more of the towers. Some interesting exhibits are sited in the towers, alas I did not have the time to fully appreciate these because of having two boys to round up and keep away from stone staircases! It’s like herding cats at times. You can see a couple of these in the video at the end of the post. When we did leave after a full four hours, we (of course) left via the gift shop. This is very pleasantly priced and we were able to pick up a number of quality souvenirs without feeling like I’d been robbed. 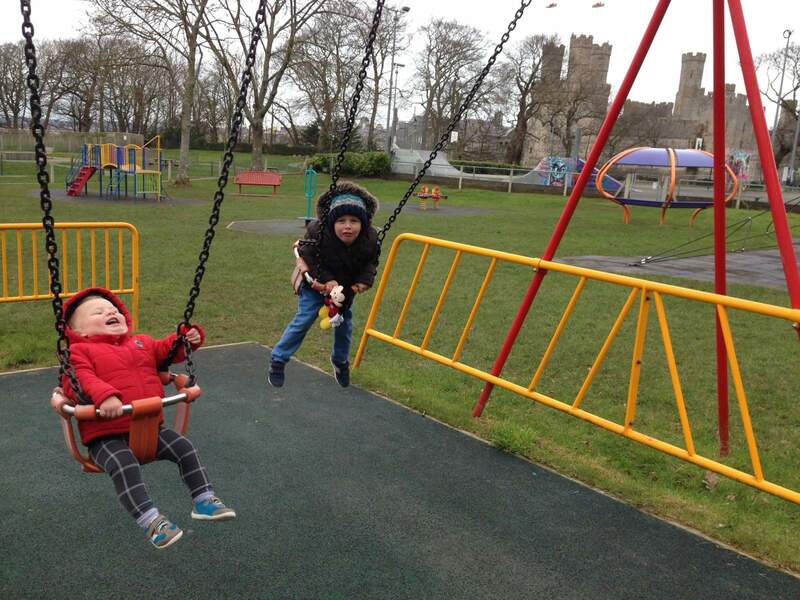 We spent a further hour or so in the playground next to Caernarvon Castle. We had such a fun time – my cheeks hurt from laughing and smiling, so it was a fabulous visit to the park! That evening we ate at the Black Boy Inn, where the service was friendly and just the right side of attentive. The food we chose was very tasty and we all enjoyed sitting next to beak of the week. The next day the boys woke up really late, and James had actually fallen asleep mid-meal in the Inn the night before, so I think all that Castle exploring did them good! 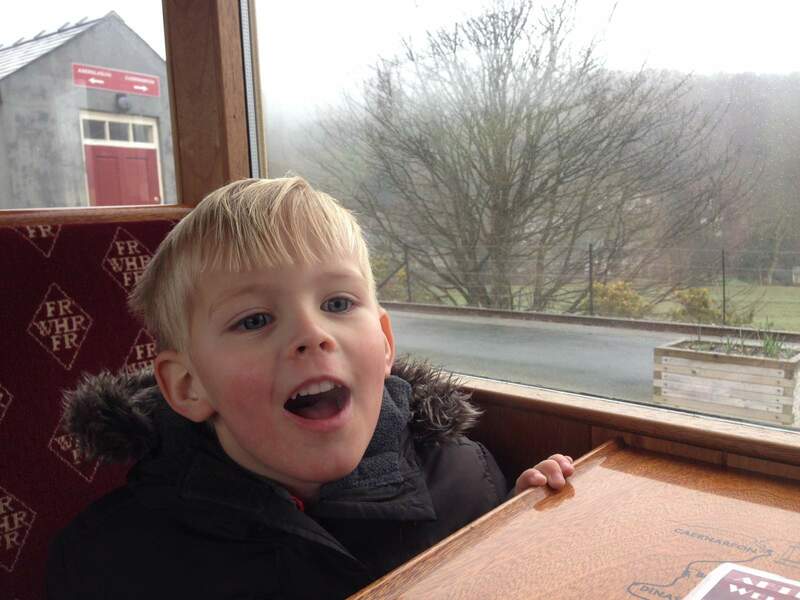 We left our guest house for the next part of our Wales Adventure – a ride on a steam train along the Welsh Highland Railway. Porthmadog, where the train leaves from, is about a 40 minute drive from Caernarvon. Car parking at the station is free, a round trip day ticket costs £22.80 for adults. One child under 16 travels free with a fare paying adult, and under 3s are free. When we visited (very early in the season) there were just two trains each day leaving from the station. You can travel for the whole time on the train without leaving your seat, if you’d like, or you can get off along the way and explore a little town and get back on the next train. We ordered our lunch on the train and then ate it on the station at Beddgelert (pronounced Bethgelert) where we had views of the spectacular mountains nearby, albeit that they were wearing cloud hats. Beddgelert was another place I visited on a school trip when I was 11, and I could sort of remember the story of the town, but didn’t tell the boys in case of inducing nightmares. The ice cream shop in Beddgelert is perfectly placed for a little break when you get off the train – it’s just down the hill and into the town – a short walk of maybe 5 minutes, if that. On the way back to the station keep your eyes peeled for Bill and Ben the flower pot men. On the train, it was distinctly colder than outside. We were able to play dragons and see our breath, which kept us amused for a little while. Outside, as the train rushed along, there were sheep and cows not yet used to the engines chuffing past, and they all ran away from the fences nearest the track. I guess later in the season they’ll just stand their ground! The weather was distinctly dull, with low lying cloud all around, so the Welsh scenery was not shown off the best way. However, there were two moments along the train journey that made our day epic; firstly while driving through the tunnel, as the window was open, smoke from the engine poured through into the carriages. While it made an amusing sight, it was actually the staff on the train that made that epic with their very silly, light hearted humour – “You think that was the smoke from the train, don’t you? It wasn’t; it was the dragon who lives in the tunnel. We have to feed him otherwise he gets really cross” – “What do you feed him?” I asked – “Naughty parents” was the hilarious reply. Reading it now, I’m not sure you’d find it funny, but it certainly tickled us when we were there! And then the piece de resistance – pulling back into the train station at Porthmadog, James was absolutely convinced that the train had turned into a car because the train runs down the high street adjacent to the road. He was wide eyed with excitement! Have a watch of this little movie (it’s less than a minute, and you don’t need sound) and see some of the highlights of our trip. So indeed, I think we found our epic! For more information on adventure holidays and short breaks in Wales take a look at www.visitwales.com where you can find lots of inspiration. Take a look, too, at the #FindYourEpic hashtag on social media to see what other explorers are getting up to. Love your pictures of the Castle, and the Train Rides looks so cool, and we do the same – We ask “what was your favorite part of the day” -we love hearing what the boys have to say! There are so many castles and yet there don’t seem to be two the same, and you can always come back for more! I guess one thing Australia doesn’t have is too many castles? It’s a great way to discover the interesting parts that stick out for kids; often the thing you think they’ll like is minor in comparison to something else entirely! Sounds like you guys had a good trip! We had a nice holiday in Wales when I was a teenager. Must head back sometime.